...Ive also got another project where I'm looking at a FIBERGLASS Stormtrooper helmet that I'm thinking is one of Jason Joiners. I know that one of JJ's "promo" sets was sold by Profiles a few years ago - was the helmet Fiberglass or ABS? I have a couple of photos but the resolution is too low to really make out any detail in the helmet. Who's the expert on the JJ stuff? I have these pics of a raw helmet (fiberglass) that I always thought to be a JJ's replica (found here). Not sure, but it looks to a finished helmet I saw and which was a JJ's replicas (That doesn't advance us more). Isn't it a suit like this one?? Just the helmets were made from fibreglass, the armour was ABS as I recall. Thanks guys - yes I have that Profiles pic, its not bad resolution but I could do with some higher res pics to compare this one against. I wonder if they did any more. Hey Jez great to see you around a bit more. I've missed your input in the hobby. That's an interesting pic, I've never seen it. It has some interesting ANH details. Any more info on it? Last edited by gizmo on Sat Aug 06, 2011 12:36 pm, edited 1 time in total. The crappiness of the picture perhaps... but the armor itself... not so much. Two very different types of armor in those two shots. The first has an ANH sandtrooper look and the second is clearly one of the RotJ or tour suits - maybe even SE armor. I'm sure it's ANH armor thats why I wanted to know more. That pic you posted Jez is SE Tour armor. Ok sorry if I`m de-railing your thread jez but here is a pic with highlights of why I beleive that pic Nairod posted is ANH.I`m not that good at photoshop pics but you get what I`m getting at.It looks like the hand guards are on backwards and apart from obvious things like there being no edge finishing trim on the peices.The helmet I`m not sure on from the crap pic but it does have a higher trimmed cap looking more like ANH and looks like the frown is repainted and generally looks ANH sharp. The pic looks like a scan from a polaroid taken a long time ago at a Star Wars exhibition judging by the A-wing pic in the background and others so I`m wondering if this is one of the suits that are still in the archives on display. Where did you get it Nairod?Please tell. 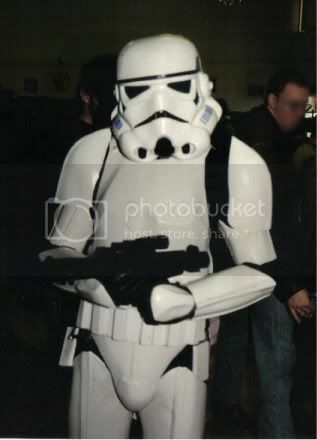 I wore a Jason Joiner trooper suit briefly many many years ago at a convention of his when one of his helpers who was to wear it was busy elsewhere.. and yup the body armour is vacced plastic and the helmets were fibreglass. Yes that helmet in the photos Nairod's posted is one of the helmets, and also I'm as sure as I can be that the Profiles suit in that large pic is also one of the JJ promo suits. I had an opportunity to buy a suit years ago, and went to see it at the small sci-fi store he used to have at Romford market. I forget how much they wanted for it, but it may as well have been a million dollars to me at the time, as I was up to my ears with student loan debts back then.. I'm fairly sure also that there were two styles of fibreglass helmet on the JJ troopers, one with the more pinched features taken from the inside of Joiner's own ANH helmet, and other more 'normal' looking version moulded (I assume) from the outside. I should still have some photos somewhere I'll try and look them out later. Sorry, I don't remember. I have it since some years now. I know that I made a pictures search on Google and found it on the last pages. This is definately ANH, although someone has gone a bit crazy repainting the frown. 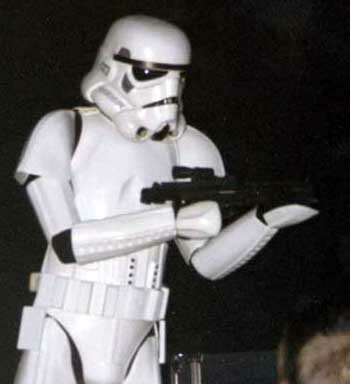 What is interesting about this suit is it has two right forearms and two right biceps, no abdominal button plate and what looks like Sandtrooper 3 button strip the same as SiMans suit. Also, notice how the ammo belt is a different colour to rest of the armour like it is unpainted and the armour painted like SiMans. Coincidence? Not a very good photo I'm afraid Jez, but the only one I could find tonight.. I'm glad you found that ANH pic interesting Paul. Iwas very excited when I saw it. Thanks for posting it Nairod. I wonder if it is Simons. I'm interested to see more on JJ helmet cast from the outside. I thought he only cast from the inside.